Netherlands keeper Michel Vorm believes Louis van Gaal would be the ideal choice as Manchester United manager. Van Gaal, the Dutch national team head coach, is the odds-on favourite to succeed the sacked David Moyes at Old Trafford. Swansea City's Vorm knows first-hand of van Gaal's qualities and his suitability for the role at United. "I think he's a top, top manager and someone who could make teams better," Vorm said. "He worked before with big teams - Bayern Munich, Ajax and obviously Barcelona - and he did well with all the teams." Former Wales captain Ryan Giggs, 40, has taken temporary charge of team affairs at United but is not in the reckoning to become the club's full-time manager. 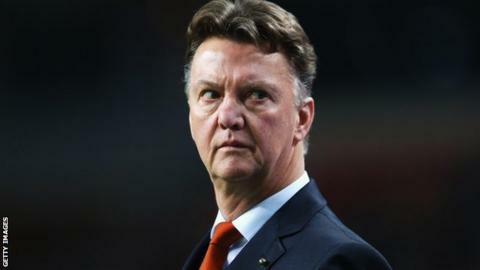 Van Gaal, who began his managerial career at Ajax before two spells with Barcelona and stints at AZ Alkmaar and Bayern Munich, is among the early favourites. The 62-year-old is keen to return to club football after this summer's World Cup, having been in charge of the Netherlands for a second spell since 2012. Former United manager Sir Alex Ferguson will play a key role choosing a successor to Moyes, who was sacked on Tuesday after 10 months in charge. Executive vice-chairman Ed Woodward will now lead the search for a new manager but will seek the advice of senior United board members, including Ferguson, who hand-picked Moyes. Van Gaal, Real Madrid manager Carlo Ancelotti and Atletico Madrid's Diego Simeone are among the names to have already been linked with the position. Vorm, who has won 14 caps for the Netherlands, has been impressed by van Gaal during his time with the national team. "He is confident because he knows he's very good in his job, and he is," Vorm added. "I've worked with him now, for the national team, for almost two years and he's impressed me. "I knew he had some qualities otherwise you don't work for big teams that he did."